Situated just a short walk from the beach, this 2 bedroom, 2 bath condo is a perfect option for your next vacation! Sand Wedge is a beautiful complex located in North Myrtle Beach, and just a few blocks from the shops and restaurants on Main Street. This condo is fully stocked and furnished, so be sure to pack light. The guest bedroom has a king bed and offers access to the guest bath. The master bedroom features a queen bed, private bathroom with shower/tub, as well as access to the balcony overlooking the pool. The living room features new flooring and an oversized TV, and the kitchen is fully stocked and ready for our next guest. The kitchen offers plentiful cabinet space and storage, and our guests will enjoy full-size appliances. This first floor condo is easily accessible by stairs or elevator. The balcony does overlook the pool and courtyard; very relaxing! The pool and hot tub is located on the same floor as this condo, and our guests love the easy accessibility of being so close to these amenities. While at the pool, our guests can overlook the pond and feed the fish and turtles. Giant sea turtles have been spotted here and they are amazing to watch! All towels, linens, and bedding are included. This condo does have a washer and dryer. 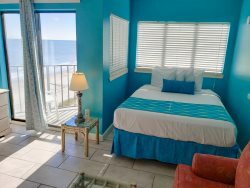 This rental is approximately a half mile to the beach, and just a short drive to all attractions, dining, and entertainment in North Myrtle Beach.